All the sights and sounds that have made Lionel Trains an American icon. See classics like the NYC Hudson, Flying Yankee, Santa Fe, Big Boy, and GG1. Amazing special effects - see our narrator Jeff in the cab of a Santa Fe F-3 as it glides down the track. You'll also meet Lenny the Lion, the first animated character ever in a toy train video. Jeff and Lenny mix it up with log loaders, coal loaders, and the gateman. Great fun starring Lionel trains, funny toy train bloopers, educational segments, and new songs by James Coffey. chris collins (fletcher north carolina) on 2014-12-11 12:54:18. Steamboy (Revere MA US) on 2017-01-01 18:11:03. 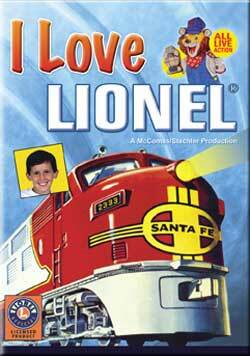 Originally released on VHS only in 2000 for Lionel's bicentennial celebration, this TM classic is the same special edition format to the popular "I Love Toy Trains" series, but all of the Toy Trains are 100% Lionel. One major gripe about the DVD menu, There's NO chapter menus! All of Coffey's songs are awesome and are still available on the 2005 I Love Toy Trains Album. The previews at the end of this when nearly released on DVD 10 Years later in 2009, consists of the first 4 Lionel Nation Series, plus other TM Children's Shows.